Confession: I ADORED every moment of my wedding but hated every minute of planning. Imagine Daria trying to feign excitement about pastel shoes. That was me. For the last 8 months, since my wedding I’ve unsubscribed from all the bridal email lists, given away old decor, and generally tried to rid my life of reminders of how stressed out I was for pretty much three months leading up to the wedding. Until last week, when I was browsing a magazine stand and caught a glimpse of a gorgeous wedding gown on the cover of a magazine and for a split second, I really wanted to buy it. Then a sudden rush of sadness came over me when I realized; damn, it’s all over. And since then, I’ve found a new appreciation for the whole process. One of the things I am most proud of is the fact that we were able to make our wedding zero waste. And people get really excited when I tell them about it. So in honor of my first “I miss my wedding” feels, I want to share my experiences and tips for reducing wedding waste and encourage brides to think about the environment along with the all the other important stuff. Why, exactly? Well, the average wedding creates 600 pounds of waste and emits 62 tons of CO2. Gross. “You shall now live happily ever after, with a quarter ton of trash and the ghosts of 1,000 wilted flowers haunting you” *sad Earth emoji*. It’s common knowledge that a wedding can cost the same as a downpayment on a house, yet the romance of it all keeps the wedding industrial complex chugging along, year after year. While the financial costs are weighed, what’s usually not discussed at the start of planning the biggest party of one’s life is how awful weddings are to the environment. The purchase of hundreds of flimsy, made in China favors and decor (c’mon, be honest, do you even know where your favors of weddings past are? ), a massive carbon footprint from extended families’ cross-country flights, thousands of pesticide-ridden flowers, often flown in, creating more emissions for a few hours of use, and bags on bags on bags of trash. I’m not saying halt ALL the weddings. They offer a place for two families to meet and come together during a very special time. But I think, and even the non-hippy dippy lot of you might agree, that the level of consumerism that results from planning a conventional wedding has become out of control, distracting from the original reason you wanted to throw a celebration; to bask in the celebration of two people making a beautiful, sacred commitment. Immediately after we got engaged, I told my husband that if we have a “traditional” wedding, it needs to be done with minimal environmental impact. We also had a shoestring budget which forced us to prioritize where we could splurge. Creating a green wedding means stepping outside of the traditional norms and aesthetics which have been peddled by companies making billions off of stressed out brides feeling the need to keep up with the Jones’ (and the Jones’ wedding board on Pinterest). Understand that you can do a lot to reduce your impact, but may not be able to do everything, and that’s okay! For instance, our wedding was in L.A. which meant most of our guests had to fly out. So we opted to focus on reducing our waste, instead. If more couples demand sustainable wedding options, vendors will start to offer eco-friendly options and services, changing an entire industry! 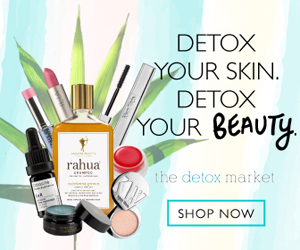 As a former stressed-out bride, I know how many things you are expected to juggle and to make it easier, I’ve offered some tips to help you reduce waste which can also reduce costs and give you and yours that guilt-free post-nuptual glow. This is huge. If you are trying to go zero-waste or just trying to reduce your impact in small ways, tell prospective vendors this as early as possible, even before you book them. It makes it so much easier when everyone is on the same page. Sometimes the vendors will have been hired for a green event in the past and they can give you ideas. I was really lucky to have a venue that was already eco-friendly and vendors that were really supportive of our zero-waste goal. The day-of will be hectic and the last thing you want to happen is have your eco-plans ruined because you weren’t prepared. If your main focus is reducing waste, the biggest challenge will be sorting it properly. Set out three waste bins; label them for trash, recycling, and compost (make sure to buy compostable trash bags). For some guests, it may be the first time they have to separate their waste so you may even want to have a monitor to help guide the guests, if you don’t have wait staff. 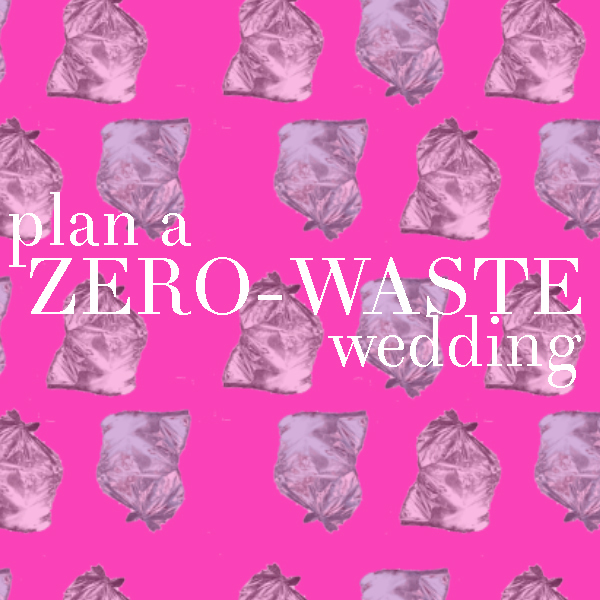 Let all wedding/catering staff know about your zero-waste goal. That way, if they are removing guest’s plates and trash, they can sort compostables and recyclables. We also asked our MC to work in an announcement about the green wedding, which helped guest separate their trash and to also spark conversation about waste, etc. Reducing the size of your guest list is the first and most impactful way to green your wedding and saves a ton of money. You don’t need to green something if it doesn’t need to be made in the first place: less food, less travel, less invitations, and reduced resources to make the goodies and favors. I recommend it from a waste-reduction, financial, and a pratical standpoint. We had about 50 people at our wedding and it was perfect. We were able to spend time with the most important people in our lives and our families had time to bond with one another because each event was intimate. This is the best way to minimize waste, preventing the per-person trash being needed in the first place. You know the message: reducing paper means reducing the amount of trees cut down. Even producing recycled paper requires water and energy. This was a point of contention and a learning experience for us. At first, I was insistent upon having e-Invitations. But I discovered that marrying a Southern man means entertaining some customs like sending paper invites. We compromised by designing our own simple paper invitations and requested that guests RSVP electronically using a feature offered on our Appy Couple wedding website. Another idea is to send seeded paper invitations. How fun is that? If you do go the paper invite route, eliminate outdated and unnecessary extras like inner envelopes and tissue paper. 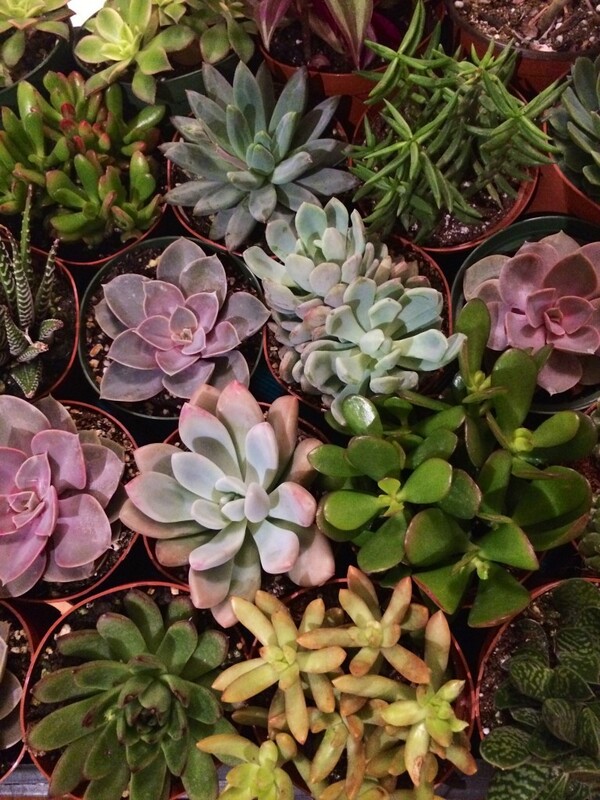 Instead of flowers on each table, we used potted succulents and our local guests were able to take home a plant that grows. The only fresh cut flowers were in my bouquet, minimizing organic waste. If you decide to use plants, try to plant something region-appropriate for example, air plants and drought-tolerant species in arid climates. Sites like Tradesy and OnceWed are great places to look for used decor and even dresses. Does it seems like everyone around you is getting married, or you’ve attended what feels like your 376th wedding of the year? Ask recently married couples if they have any items they’d be willing to let you borrow. Most of the time they are happy to get rid of box of wedding stuff and send it to a good home! Another thing to consider when looking at venues is to factor in how much you’ll have to spend on decor. Our venue was the pricier of locations we looked at but it was already so beautifully decorated so we didn’t need to add much, minimizing costs and potential waste. Do you really need new matching dresses, clutches, earrings, shoes, etc? Trust in the fabulous taste of your best girls by giving them a color palette and style guide and let them choose their own dresses. This also lets them use items they already own, reducing the need to buy new stuff. If they do have to purchase a new dress, encourage them to buy something they’ll actually wear again. They will thank you for this. I had two bridesmaids and loved seeing their personalities expressed through their gorgeous dresses; it made for more interesting photos, too! Planning a wedding on a shoestring budget in L.A. is tough; like make you want to curl up in a ball an cry woe-is-me tears, tough. One of the most challenging things was trying to feed everyone within our budget. We decided to book a food truck because it was more cost-effective. But then, I thought, there’s no way we could have reusable dining ware, so we decided to supply the food truck with compostable plates and cutlery. 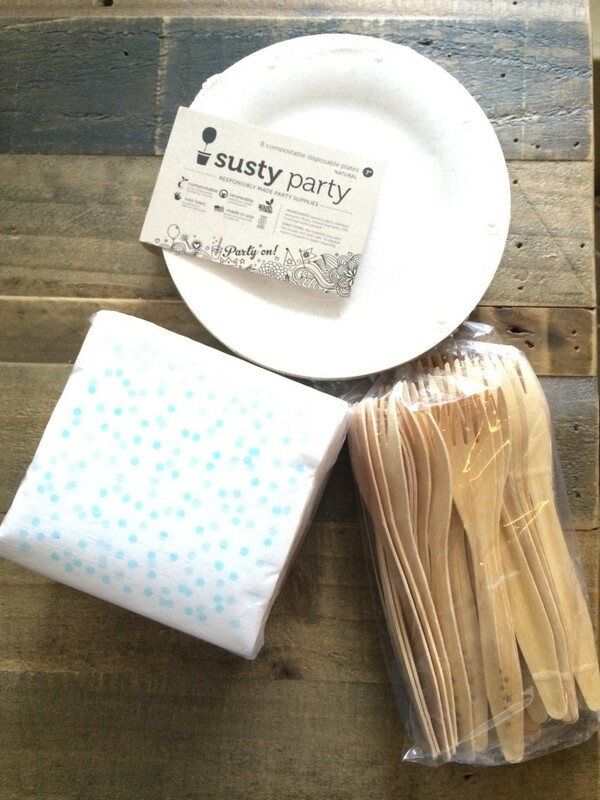 We ordered our items from the fun and stylish Susty Party and they looked really nice! Guests were even reusing their plates when returning to get seconds; they were that durable. 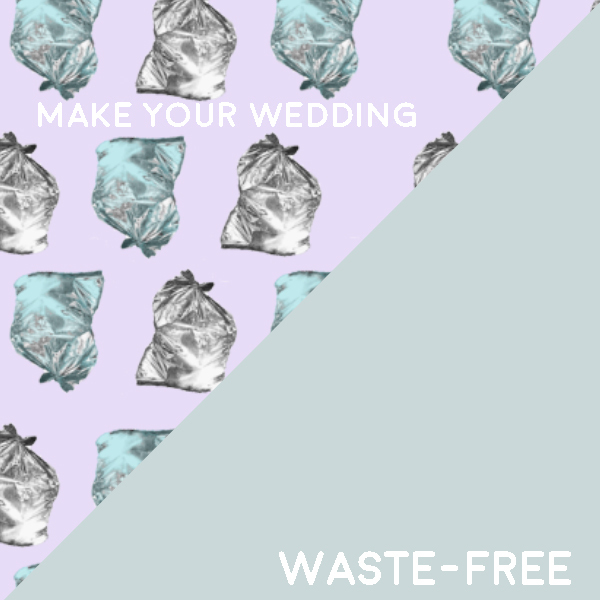 Compost at your wedding: you can do it!!! One of the huge generators of wedding waste is leftover food. Of course, please donate meals before you compost! There are most likely local food banks and shelters that would love to accept your tasty food. Before you buy compostable items you’ll need to find a place that will take your compost. 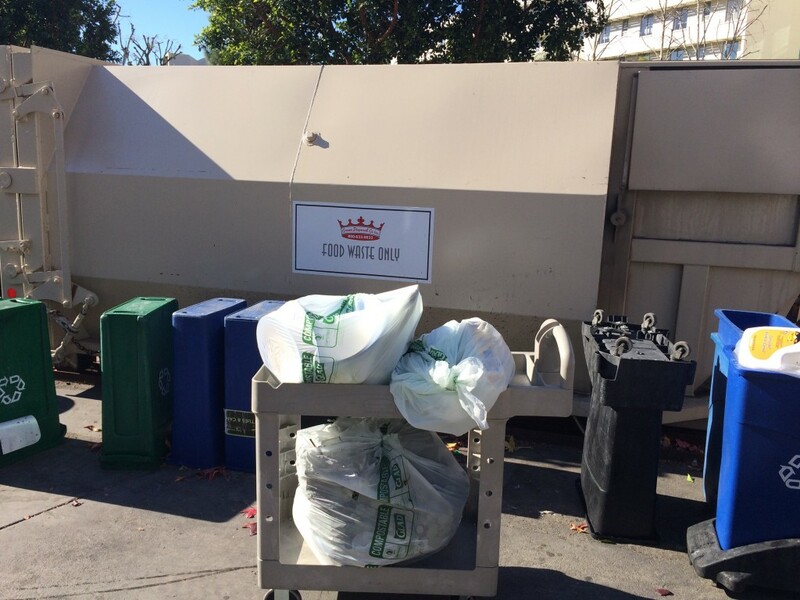 Your venue’s waste hauler may pick up compost, and if so, problem solved. But like most cities as of now, collecting compost is not the norm so you may have to do some hunting for a set up that is equipped to handle the type of compost your wedding will generate. Will your menu contain meat and dairy? If yes, then you will most likely have to find a commercial compost facility to accept your waste (like a major waste hauler company). Most small compost setups, like those in schools and in backyards, do not accept meat, cheese, and shellfish items because they turn rancid and attract pests and animals. All compostable products are not created equal. Some compost products will indicate that they are made for commercial compost facilities meaning that they will not breakdown fast enough in a small backyard set up. If you are buying compostable items for your wedding, make sure you whether they’ll need to go to a commercial facility. Check out non-profit composters in your community. If you’re serving a vegetarian meal, they would probably be happy to take your compost. If not, still ask the staff; they will most likely be able to offer you some guidance and point you in the right direction. I talked to a couple neighborhood compost organizations, and even though they couldn’t take my waste, they were jazzed about our plan and were really eager to help! 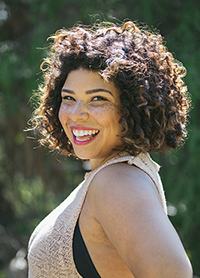 For all you Angelenos, here’s a list of my awesome vendors that help us with our green wedding! If you are looking for a green wedding consultant, or just want to discuss ideas, I would love to help! Click the ‘contact me’ section of this site and I’ll get back to you! Have questions or more suggestions for brides? Leave a comment!